Last week about 40 runners set out for a nice flat course on a relatively comfortable Sunday morning with Lake Quannapowitt as the long run destination. This week we’ll be heading out on a similar route to Horn Pond in Woburn. There will be a few extra miles and we’ll introduce you to a major Winchester hill you will visit a few times through the training season. If you’re running short, consider carpooling out to water stop 1 and starting your run from there for a chance to see the more interesting part of the run. The route starts at Brueggers and runs down Main Street in Melrose, past Dunkin Donuts, to West Wyoming Ave. Turn right there, running into Stoneham, past Grimsby’s, and up Pond Street to Spot Pond. Turn left, run past the Stone Zoo, straight out across Main Street in Stoneham, past Friendly’s onto North Border Road which becomes Park Street after you cross the on ramp to I-93. At a set of lights, turn left on to Marble Street which becomes Forest Street as you cross I-93 into Winchester. Along the left you’ll find Eugene Drive and Water Stop 1. If you’re running short you’ll turn back on Forest, to Marble and go straight through the set of lights at Park. Marble will take you back to Main Street where you’ll cross on to Summer Street. This road will go through one set of lights and then curve over to some lights on Franklin Street. Turn right there, pass Stoneham High School, and continue all the way to Main Street in Melrose. Turning right on Main and head back to Brueggers. Long runners will leave water stop 1 heading down a long downhill along Forest Street to a set of lights at Washington Street, where the Ginger Bread Construction Company. Turn left on Washington and then a right at the set of lights onto Cross Street. This will bring you from Winchester to Woburn, where you’ll turn right on Main Street. Cross over to the opposite side of Main and take a left on Lake Street. Lake Street, oddly enough, will bring you to Horn Pond (not a lake). The parking lot at the southern end of the lake will be on the right, and there you will find water stop 2. After replenishing your fluids, and using the public restrooms if needed, run a clockwise loop around Horn Pond following the path out of the parking lot, along a path on the western side of the pond. There will be a few left turns that head into trails, don’t take those unless you’re trying to get lost. Unless you want to get wet, wait until you get to Water Street at the opposite end of the pond to take a right turn. Water street will take you to a hill where some choose to take a path on the right to cut the corner but the official route goes up the hill to a right turn on Arlington Road. This will bring you past a school (see if you can find the markers for the planets along the sidewalk) back to Lake Street. If you need a drink, you can head back to Water Stop 2 with a right on Lake, otherwise take a left and head back the way you came: Lake Street, right on Main, quick left on Cross back to Washington. At Washington Street, take a left and then a right at the Gingerbread Construction Company onto Forest Street. Run up, up, and more up to Eugene Road where the water stop will be waiting for you. After the water stop you’ll follow the same route the shorter route runners ran. Forest onto Marble, cross Main Street in Stoneham to continue straight on to Summer, right on Franklin, right on Main Street in Melrose and back to Brueggers. With either 7 or 14 miles under your belt, sit back and have a cup of coffee and a bagel and enjoy the post-run satisfaction of a job well done. The water stop plan is that Tom, Hank and I will be at your service once again. A little planning ahead. Next week I won’t be around on Sunday. My trusted assistant Lois won’t be available either. I believe Tom and Hank will be around to do water stops, I’ll post the route, but I will need someone to collect money and send the runners out. Volunteer? We had a good crowd last week as about 40 runners tackled the hills and the heat. This week we’ve got a much flatter and shorter run ahead of us. The route will start from Brueggers at 8AM Sunday, heading north on Main Street to Wakefield. Continue on Main Street to the intersection of North, Nahant and Main. Across the street from Jiffy Lube is Nick’s Pizza, where you’ll find Water Stop 1. If you’re going short, after your water, turn around and head back to Brueggers along the same route for a nice 6.1 miles. Those running long will add a loop of Lake Quannapowitt. Continue north on the right side of Main Street through Wakefield Center and to Lake Q. Complete a counterclockwise loop of the lake by following Main Street along the east side of the lake, turning left on Lowell Street and left onto Quannapowitt Parkway, to a left on North Ave, over to the corner by the softball fields where you’ll turn left on Church Street. Once you get to the church, turn right on Common Street and run along Wakefield Common merging back on to Main Street. When you get to Nick’s stop for another water stop before following Main Street back to Brueggers to finish up your 10.7 miles. I’ll take care of the water stops. First, a public service announcement: Last Saturday Melrose was enforcing the 3hr parking limits and issuing tickets throughout the day. Whether this will occur on Sundays too, I’m not sure, just be aware. Other than that it was a great kickoff to the SLR’s Fall 2017 season. I estimate about 30 runners hit the road and got their first training run in on the road to Baystate (which btw I have the wrong week down for Baystate, it’s one week later so adjust accordingly) or Chicago. This week, ironically Sunday July 16th is the 82nd anniversary of the first parking meter, and we’ll be parking behind Brueggers once again and heading out for a long run. 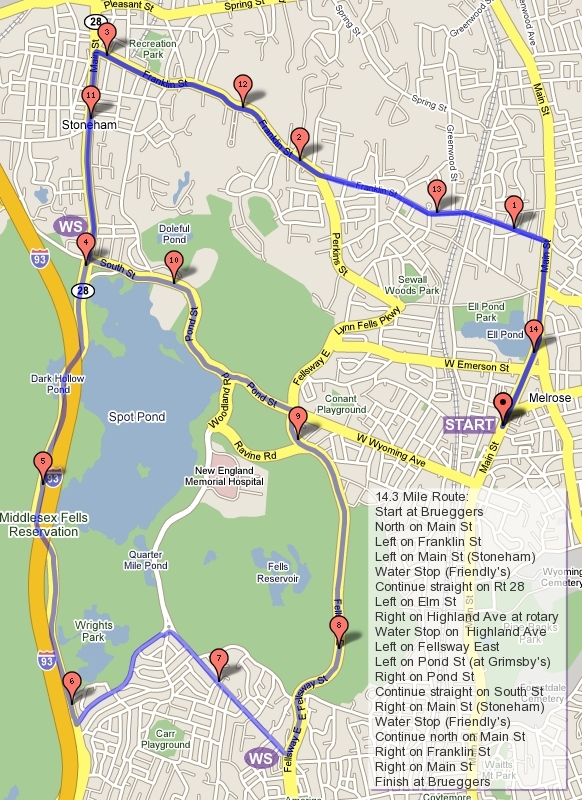 This week’s route is 12.5 miles for the long run, 7.1 for the shorter route. We’ll start out heading south on Main Street, turning on to West Wyoming Avenue and running to Grimsby’s. Turn left there onto the Fellsway East. Reacquaint or introduce yourself to the hills of the Fells, they are your friends, they make you a better runner, be positive, keep your posture, and head through them as you make yourself to the Highland Ave traffic circle. Turn right there onto Highland Ave and run another half mile until you find the water stop on the left side of the road. After the water stop, if you’re running short, you’ll continue through a rotary onto Woodland Road, along the Melrose side of Spot Pond (referred to by me as the front side of Spot Pond). Turn left onto Pond Street, back down to Grimsby’s where you’ll turn left onto the LynnFells Parkway, and make your way past Melrose High School. Turn right onto Melrose Street and right on Main Street to return to Brueggers. Long runners, after the water stop turn left at the rotary on to Elm Street where you’ll circle Spot Pond. Go to the end of Elm Street, turn right onto the Fellsway West and follow that under I93, past the Sheepfold at the Fells, over I93 and carefully across an off ramp of I93. Turn right into a parking lot at Straw Point at Spot Pond. There will likely be a bonus water stop there if a volunteer shows up. (Tom or Hank or both?). Continue through the parking lot, turning right as you exit to pass Stone Zoo and continue up to the Flynn Hockey Rink. You’ll pass through the rotary again and find the water stop on Highland Ave still waiting for you. After this stop you’ll turn left onto East Border Road and up to the Fellsway East. Turn left at the lights there and go back through the hills, past Grimsby’s onto the LynnFells Parkway, and past Melrose High School. Turn right on to Melrose Street and right on Main Street and make your way back to Brueggers. Ok, Who’s in? Roll Call! It’s time again for the Sunday Long Run to begin, and once again we’re already altering the plan. This Saturday night is the Melrose Running Club Summer Party, so the Sunday Long Run will move to Saturday Morning this week. (1) Respond here with your intention to attend the run. I use this blog to identify how many runners to prepare for. If you don’t let me know you’re coming there may not be enough supplies for all the runners. It’s easy, press comment, type “IFTF” if you’re in for the full route, or “IFTH” if you’re in for the half route. (2) Show up at Brueggers before 8AM. They graciously allow us to meet there in the morning, but be sure to respect their business. Stay out of the area that their customers line up in. Be quick and clean in the bathrooms. Keep your voices down, you have many miles to talk during, don’t raise your voices over each other in the store. If you can’t stay quiet, head out to the sidewalk in front of the store. (3) If you’re running long you need to donate $2 per week towards supplies. If you’re running the shorter route donate $1. If you don’t feel like donating, please do not take any supplies at the water stop. There will be water, Gatorade, and Powerade at the water stops. There will also be some candy at the stop. If you require anything else at the water stops, bring it to Brueggers and we’ll bring it to the water stop. (4) Review the route. There is a map to the right for each route we’ll run. Review it, memorize it, print it out if you need. Staying on course is your responsibility. If you wander off I will not find you, because you’re lost. (5) Let the water stop crew know your plan. If you’re not running the whole route we should be aware, otherwise we will stand around for hours waiting for you to come through the stop. If you change your plan during the run, let us know. (6) Enjoy your run, then relax at Brueggers afterwards. Bringing outside beverages and food into their business is frowned upon. Please consider returning their kindness for letting us meet there by patronizing their business. Many locals are planning to make their way to the Windy City for a fall marathon so I expect a good sized crowd on Saturday. The Week 1 route starts out up Main Street, past Ell Pond, bearing right onto Green Street, and turning right at the traffic lights onto the LynnFells Parkway. Follow the LynnFells to a set of lights, turning left on Main Street in Saugus. If you’re running short you’ll quickly turn left on Howard Street, and continue to Green Street where you’ll turn left. Green will merge onto Main Street and you’ll finish at Brueggers. Long runners continue on Main Street in Saugus as it becomes Farm Street in Wakefield. There will be a water stop at Wakefield High School, on your right. After the stop you’ll continue on Farm Street to the end, where you will turn left on Water Street. Continue to Wakefield Center and turn left on Main Street. Follow Main Street back to Melrose Center to finish at Brueggers.